These sweeping machines sweep almost anything up with its high speed broom and stores it in the hopper to be emptied later. The Model 34 even runs quiet enough to work around animals. 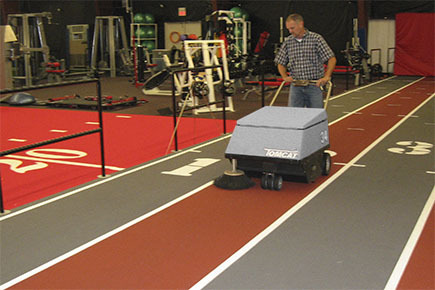 The perfect way to quietly and quickly clean your indoor running track and complex is with a 34 Floor Sweeper. 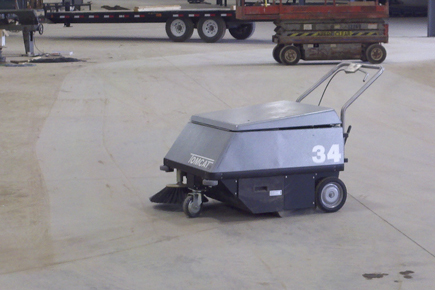 This sweeper works on any floor type. 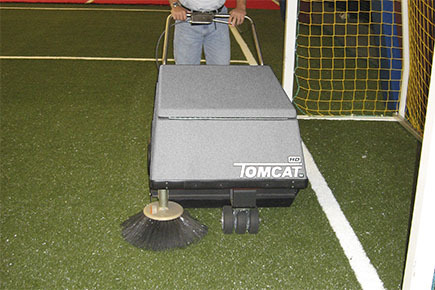 Astro Turf can sometimes be hard to clean, but not with the Model 34! We have a special option to make your 34 run better over Astro Turf by adding on a different front caster. 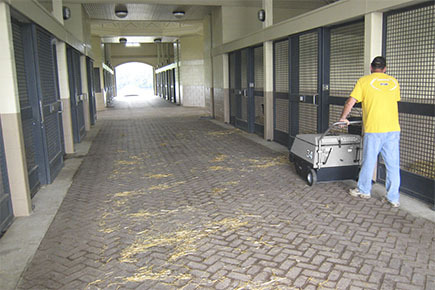 While dust control is normally a problem with floor sweepers, our Walk Behind Sweepers have built in filtration systems that control dust from escaping or flying around. This Walk Behind Sweeper has a built in side broom for areas where you have to get underneath a ledge that isn't normally within reach. 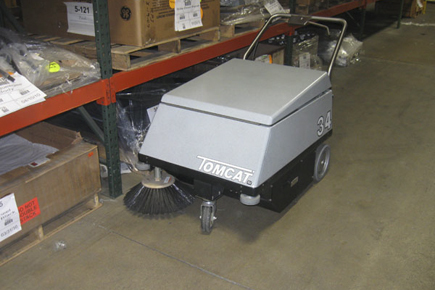 Tomcat's Floor Sweepers are built to sweep factories: dirt, dust, metal shavings, foundry sand, bolts, paper, wood, whatever there is. Tomcat's are compact, not light-duty. 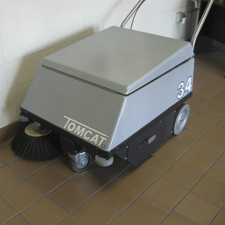 The Tomcat model 34 Walk Behind Sweeper is the machine that built our company. A Commercial Sweeper famous for its ability to survive decades in the harshest applications: including mines, brick manufacturing and rugged steel mills. 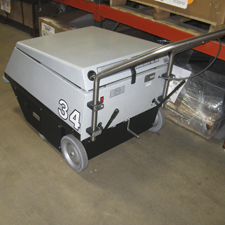 Designed almost 25 years ago, this floor sweeper can sweep through thick saw dust found in furniture manufacturing plants and the dust in paper mills. Bulk powder packaging clients with concrete powder or copier toner like its sweeping power without it blowing dust everywhere. 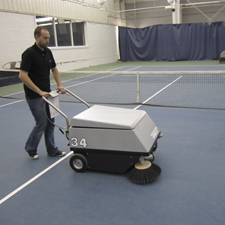 The battery powers the sweeper for over 4 hours on a single charge and the sweeping broom is self adjusting for wear. 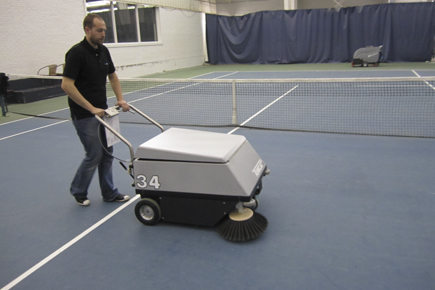 In these images you can see many of the different applications of the 34 Floor Sweeper: from small office areas, to inside tennis courts, as well as inside of warehouses. The Model 34 floor sweeper is always up for the task.